Who Decides Where You Travel? I walk into a beautiful café. The furnishings are contemporary and comfortable. I am served my café Americano with a glass of filtered water, gratis. What a lovely place, I think, as I look through my pictures while seated in a rocking chair. A couple is dropped off in a horse-drawn carriage that they have apparently rented for the afternoon. The owner is familiar with them. When I settle up the bill, the dream is over. I would have paid less for a coffee in Brooklyn. Maybe even half as much. I am in Granada, Nicaragua trying to figure out why it is such a tourist destination. Experiences like the one in the café make me think that the formula is quite simple. People just have to start going to a place for one reason or another and then the process is simply self-perpetuating. Before long, there are several establishments that are expensive even for foreign visitors. Maybe it’s arbitrary. The long street that leads down to Lake Nicaragua is lined with bars and restaurants with names in English and fancily dressed servers trying to pull you in from the street. There is an abundance of (most likely) mediocre Italian pizza and pasta restaurants, which is always a clear indicator for me that I am in the wrong place, no matter what country I’m in. Past all the over-priced dining is the Lake. The view is unexceptional. The walk, past restaurants and bars that cater to white people, is hot and humid. I balked when I was told that Granada is hotter than Leon. The truth, on this long walk to the disappointing view of Lake Nicaragua, is hard to tolerate. Admittedly, there are things to do in and around Granada. The market in the south of town, although not unique, is full of life. 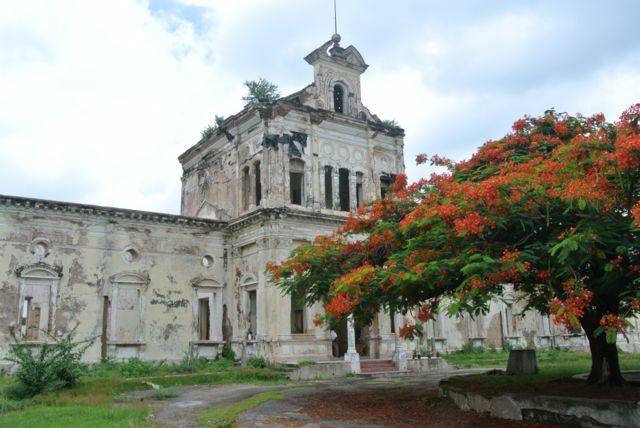 There are many old colonial buildings and churches around, if that’s your thing. In my opinion, a day or day and a half is sufficient for seeing everything in that category. And that’s if you take frequent breaks at outrageously priced coffee shops. One can go on a boat tour of the grouping of small islands close to Granada. And I’m sure you can ride a horse somewhere. In the end, I’m not able to figure out why Granada was chosen by someone on the Nicaraguan tourism board as the place to go. But I don’t really understand tourism. It’s worth a visit, and easy to get to, but not action packed. However, being a tourist destination also brings certain conveniences. Lucho Libro Bookstore provides an excellent selection of new and used books in English. Oasis hostel gives you free pancakes and coffee in the morning, has a swimming pool, and plenty of hammocks for all your relaxation needs. At $9/night for a dorm bed, it’s not the cheapest place in town, but clean and friendly. Granada’s proximity to the town of Masaya is nice, as the bus ride costs less than a dollar and takes less than an hour. There you find the artisanal capital of Nicaragua, with everything from chocolate, cigars, hammocks, painted wooden stuff, machetes, and t-shirts. The craft lover ought to leave room in her bag for this place. This entry was posted on July 12, 2013 by alexjparton. It was filed under Americas, Nicaragua, Travel and was tagged with books, Granada, lake nicaragua, Masaya, nicaragua, old colonial buildings, tourism, touristy.